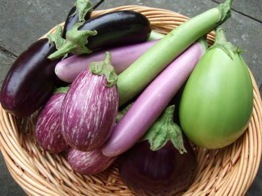 For more abput eggplant, see http://en.wikipedia.org/wiki/Eggplant. Eggplant, Olive, and Parmesan Sandwich for Election Night November 4, 2008 when Barack Obama won! This dish, adapted from The Shun Lee Cookbook by Michael Tong, is served cold, and makes a wonderful summer appetizer or side dish for grilled fish or steak. 1. Bring a large pot of water to a boil, and keep it at a low boil. 2. Using a sharp knife, lightly score the skin of the eggplants in a crosshatch pattern, with the lines about 1 inch apart. Halve or quarter the eggplants lengthwise to make sticks about 1/2-inch wide. Cut the sticks into 2-inch lengths. 3. Heat a large wok over the high heat. Add enough oil to come about 1 1/2 inches up the sides of the wok, and heat it to 350°F. Working in batches without crowding, fry the eggplant, turning it occasionally, until tender, about 45 seconds. Do not overcook it or it will lose its shape. Using a wide wire-mesh skimmer, quickly remove the fried eggplant from the oil, dip it briefly in the boiling water and then transfer it to paper towels to drain. Repeat with the remaining eggplant, drying the skimmer after each use. 4. 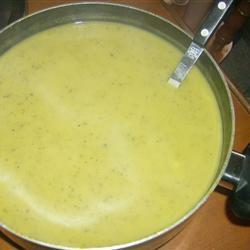 To make the sauce, heat 1 tablespoon oil in a small skillet over medium-low heat. Add the garlic and stir-fry until fragrant, about 10 seconds. Add the scallions and black pepper, and stir-fry until the scallions are wilted, about 20 seconds. Add the sesame oil, and transfer the mixture to a bowl. Add the vinegar, sugar, soy sauce, rice wine, hot bean paste, and hot chili oil, and mix well. 5. Place the eggplant on a serving platter and pour the sauce over it. Serve at room temperature. Preheat oven to 350.Drizzle some olive oil at the bottom of an 8*11 baking dish. 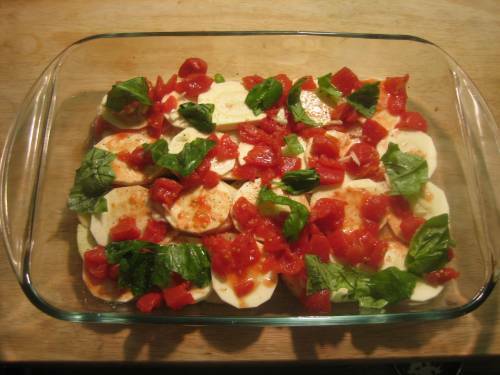 Make a layer of sliced eggplant, seasoning generously with salt and pepper. Add a layer of sliced potatoes. Add another of sliced parsnip rounds. With a spoon, add as much diced tomato as you’d like. Sprinkle with slices of garlic and torn up bits of basil. Now repeat.Cover casserole with slices of fresh mozzarella, and bake for 40 minutes, or until cheese is browned and the sides of your dish are bubbling. Let stand for 5 minutes, slice and serve with crusty bread. 1. Preheat the oven to 425 degrees. On an oiled baking pan, roast the eggplant cut side down for 20 minutes, until the eggplant is very soft and tender. Scoop out the pulp. Place in a large bowl and mash with a large fork or spoon. 2. In a medium bowl, mix the tahini, olive oil, garlic, lemon juice, and salt and pepper to taste; add water for creamier consistency. Stir into the mashed eggplant. If a smoother consistency is desired, you can blend the ingredients in a food processor. 3. Garnish with tomato slices or sliced cucumber. Serve with a dash of olive oil on warm pita bread. Heat the oil in a large pot. Stir in the onion and jalapeño, and season with curry powder, cayenne, and salt. Cook and stir until onion and jalapeño are tender. Stir in zucchini, and cook until tender. Pour in the chicken stock. Bring to a boil. Cover, reduce heat to low, and simmer 20 minutes. If you want, add some potato, however do not use blender. With potato, it is best to put through a purée mill. This recipe was one of the five zucchini dishes that Gabrielle Hamilton, the chef/owner of Prune in New York City (and Melissas beloved sister) prepared during her battle against Iron Chef Bobby Flay on that popular television program. Gabrielle managed to slay Flay in that episode, and you'll see why once you taste this sensuous dish. Harissa, the deep red spicy North African chile paste, was her secret weapon. Toast the caraway seeds in a small heavy skillet over medium heat just until they are fragrant, 1 - 2 minutes. Put the toasted seeds in a mortar and crush them with the pestle. Add the garlic and a good pinch of salt and crush the mixture into a paste. Stir in the lemon juice, harissa, and oil. Season with salt. Bring a pot of heavily salted water to a boil. Add the zucchini and cook until very tender and soft but definitely not falling apart, about 5 minutes. Drain well, then put the zucchini into a wide bowl and gently toss with the harrisa vinaigrette while still warm. Dress the zucchini with the olives, feta, parsley, and preserved lemons, finishing the dish with a good drizzle of olive oil.